Cool pink leather bracelet, 25mm - with quote tag of light metal. "Everything will be okay in the end. 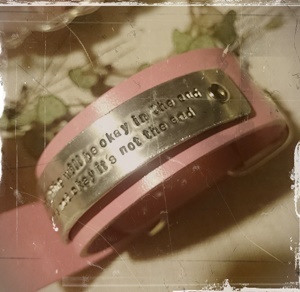 If it´s not okay it´s not the end"
There is a little nickelfree tag on the buckle, "rosa bandet" (pink ribbon). Below you choose length of bracelet, I always make a few extra holes so it will be adjustable.